Two weeks from now I’ll be flying over Africa somewhere, headed to Zambia where we will serve God at Lifesong for Orphans. What’s really awesome about this trip is that Janeth, one of my best friends, will be going on the trip as well! But there’s something you don’t know about our friendship. Let me tell you about Janeth. Janeth is amazing. Although just a young grasshopper, she doesn’t mind being friends with an old woman like me (she’s 24 and I’m 32). Never once has age stood in the way of our friendship. She always makes me laugh, and since we became friends almost a year and a half ago, she’s been there for me whenever I’ve needed her. Even though Janeth is in Texas and I’m in Indiana, she’s managed to be my rock this past year, especially when I had my heart broken. Her advice and prayers got me through some pretty rough times. What I love about her the most is that she’s such a Godly woman. She is so spiritually mature for her age, and I have learned so much from her beautiful heart for God and her passion for humanity and the earth in general. She is, quite simply, one of the most amazing people I’ve ever known. 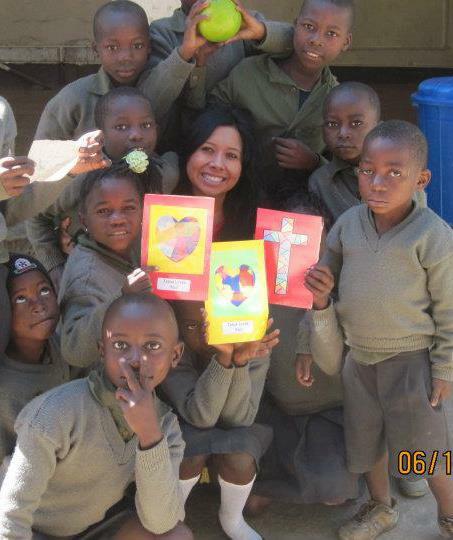 Janeth is also the reason I even know about the trip to Zambia! The day she suggested I go was one of the coolest things ever. I’m so excited to serve God on this trip and to do it with one of my best friends. Janeth and I have never met. No, we didn’t meet on FriendFinder.com (is there such a thing? ), or some sort of Christian website. We met right here, on WordPress. We were both going through some heartache at the time, and her words in that email were so comforting and helpful. She was very open about her relationship with God, and what she was going through. Little did I know that a little more than a year later I would be going to Africa with her. What’s weird to think about is that GOD knew. He orchestrated this entire friendship. I have never been so sure of anything in my entire life. God has used Janeth in a major way to help me grow as a Christian. I believe He’s used me in the same way for her. Janeth and I will meet for the first time in London when I meet the rest of the group going to Zambia. We’ve text and Skyped before, so we’re definitely not complete strangers. Like I said, she’s one of my best friends! We talk pretty much every day! I know plenty of people will find this all rather bizarre, and that’s OK. I think it’s all pretty awesome that God would use someone so far away to help transform my life. Just one of the many amazing things He’s done for me! Thank you, Janeth! Can’t wait to serve God together in Zambia! No more “Summit City” for Summit City Single? Natalie, your blog reminds me that “unity in spirit” can be so powerful – not only for each other but also as you will minister together in Zambia. “Behold, how good and how pleasant it is for brethren to dwell together in unity! It is like the precious oil upon the head, running down on the beard, the beard of Aaron, running down on the edge of his garments. It is like the dew of Hermon, descending upon the mountains of Zion; for there the Lord commanded the blessing—life forevermore.” (Psalm 133 NKJV) May your anointed friendship flow as you travel, have divine encounters with others and finally to the people of Zambia so that all may know about salvation.. Thank you so much! And what wonderful verses to share. Thanks for sharing! i am just floored. you have no idea how much you mean to me.